For a few of us, loyalty liability sounded like an oxymoron. However, in the wake of changes in regulatory regimes and accounting standards globally, Loyalty is quickly losing its meaning in advancing brands, financing corporations and engaging billions of consumers around the world. Therefore, we set off to reverse it, creating the infrastructure, mechanisms and the technology for turning loyalty points into a new and exciting asset class - in tune with the needs of sponsors, partners, investors and consumers. It is how ACE was born. To be the ultimate game changer for loyalty operators, sponsors and investors by creating sustainable loyalty economics, optimizing loyalty point yield, managing balance sheet liability and providing access to capital by monetizing loyalty currency into a new class of financial instruments. ACE will revolutionize the loyalty economy unlocking over $1 trillion in market cap by creating specialist trading venue for loyalty points backed securities, channeling liquidity, enhancing and attracting new investment to the loyalty sector. We facilitate issuance and trading of points between loyalty industry participants, partners and investors via point backed financial securities. We enable members to use the ACE Primary market to list loyalty currency instruments/contracts and/or package tranches of points at different values for sale to approved parties including new investors who up until now could not buy into this new asset class. Contracts can also be traded on the ACE secondary market where prices are driven by intrinsic valuation and market demand. Currently there is no capital markets infrastructure that unlocks the power of loyalty currencies and brings new financial participants into the Loyalty ecosystem. ACE is the first platform specifically designed for institutional loyalty players to optimize loyalty program economics. Our core team and advisors have 70+ years of relevant experience in loyalty, finance, capital market and securitization of assets. ACE has entered in an exclusive strategic partnership with NASDAQ, global leader in exchange technology and operations to power its trading platform and related services. 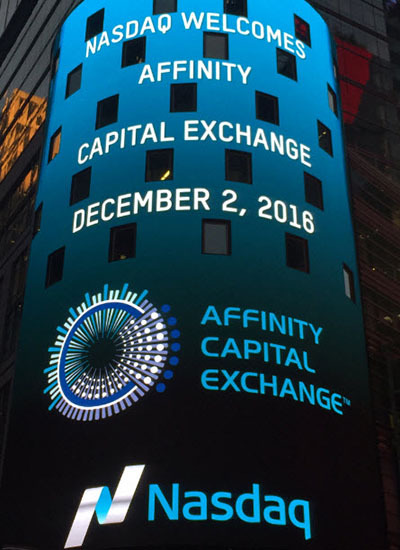 Affinity Capital Exchange (ACE) and the NASDAQ OMX Group (Nasdaq:NDAQ) have signed a 5-year technology partnership agreement under which ACE will integrate and operate NASDAQ OMX's world-class market technologies for trading and clearing of a new asset class called Points-Backed Securities.